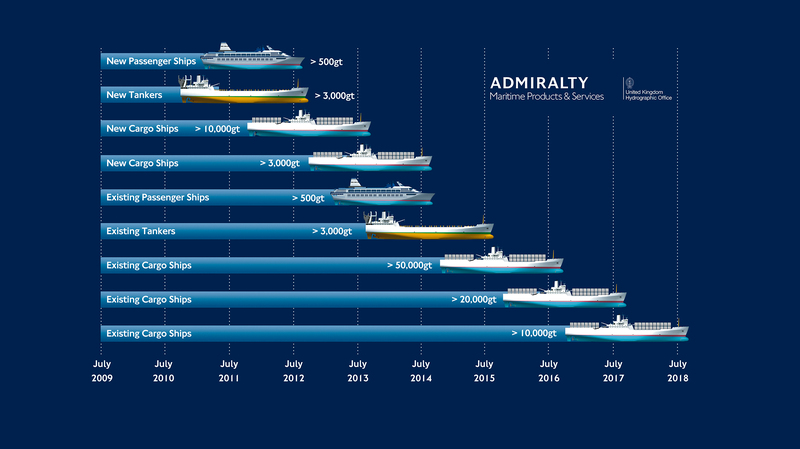 Almost three-quarters of cargo ships with a gross tonnage of over 20,000 tons are already compliant with the SOLAS-mandated Electronic Chart Display and Information System (ECDIS) deadline of July 1, 2017, according to the latest figures published by the United Kingdom Hydrographic Office (UKHO). This corresponds to a total of 9,680 cargo vessels having a gross tonnage of over 20,000 tons which use an Electronic Navigational Chart (ENC) service. The UKHO estimates that a further 3,828 cargo ships over 20,000 GT are yet to make the transition to using an (ENC) service and therefore do not yet meet Safety of Life at Sea (SOLAS) regulations on ECDIS carriage. The amendment to SOLAS Chapter V regulation 19.2 requires ships engaged in international voyages to be fitted with an ECDIS no later than the first survey on or after a date based on the type of ship and its size in gross tonnage. Only ENCs supplied from official hydrographic offices can be used in ECDIS to meet SOLAS requirements for nautical charts and to be considered ECDIS ready. “However, it is important to be aware of the implications for the several thousand of cargo ships and any others whose ECDIS deadline has passed without having yet adopted ECDIS. For example, if a ship is detained by Australian Port State Control for non-compliance, the only way of lifting that detention is to first become compliant. Whilst ships have until the first survey after their deadline, in some cases this may mean fitting an ECDIS and training crew at considerable cost and delay,” Mellor added. Since the ECDIS mandate was introduced, the UKHO said it has highlighted the importance of understanding that having an ECDIS fitted does not guarantee compliance or constitute its effective use. In addition to subscribing to an ENC service, shipping companies have been encouraged to ensure that they have revised bridge policies and procedures in their ship’s safety management system to reflect the requirements of ECDIS operation, that ECDIS software is upgraded to comply with the latest IHO ENC Standards, and that its bridge teams are competent in using ECDIS to its full potential. With the Australian Maritime Safety Authority (AMSA) taking a zero-tolerance approach to breaches of these regulations, requiring compliance with SOLAS under Australian law, this legislation cannot be ignored, UKHO pointed out. Between January and May this year, AMSA has recorded 142 deficiencies under ‘safety of navigation’, which resulted in 15 vessels being detained. Many of these deficiencies related to ECDIS and with ECDIS-awareness campaigns planned by the Paris and Tokyo MoU for the end of the year, there will be an increasing focus on the safety of navigation. Posted on July 12, 2017 with tags ECDIS, ENC, UKHO, United Kingdom Hydrographic Office.